_William Franklin Howell, the son of Richard and Medora Elizabeth McDonald Howell, was born in 1890 in the Clear Fork area of Parker County. After his father’s death in 1905, he helped his mother farm until her remarriage when he went to Oklahoma and worked in that area for a time including working on his uncle’s homestead. In April of 1918 during World War I, he joind the U.S. Army at Hollis, Oklahoma. From there he was sent to Camp Travis, Texas where he was assigned to Co. E 357th infantry, 90th Division, leaving with his division for over seas duty in August. He fought in various battles in France, including St. Michiel and Argonne Woods. After the St Michiel Battle, Howell was placed in a special designated shock troop and sent to the front. While at the front, he was overcome by mustard gas and left for dead. He was reported to his family in Weatherford as “missing in action”. Three days before the Armistice, he contracted influenza and placed in the hospital leaving his unit which went on to Germany as part of the Army of Occupation. He was assigned to another unit and sent home on a hospital ship. 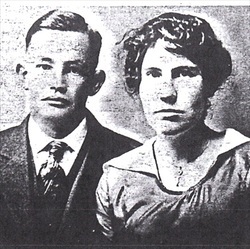 On his return to Weatherford, he married Cora Lee Dugan, daughter of Austin Joseph and Mollie Belle Bryson Dugan, in 1919, After living in town for a time, he and his family moved 1 ½ miles east of Weatherford in 1929 to a small 30 acre farm. He farmed and worked with R. B. Threadwell for many years in the painting and contracting business. After Howell’s retirement, he still farmed specializing in growing yellow-meated watermelons, which he sometimes sold from underneath a large Cottonwood tree in front of his home on the Fort Worth Highway. Children of Cora and Frank Howell were J. R. who died in infancy, Juanita who lives in Fort Worth, William Frank Jr lives in Smithfield and is married to Wanda Jean Carter, daughter of Leonard and Elda Gibbons Carter, (children-Charles Richard, Kelly Stephen, and Laura Tracy); Virginia married #1 Grady S. Clark (deceased) and is now married to Francis (Al) Alexndre and lives in Abilene (daughter Kathryn Sue), Wanda Fay married Don R. Cope, son of Henry Wilson and Helen Worrell Cope, (children: Larry Don, Richard Wilson, Carolyn Jo, and Donna Fay0 and lives in Arlington. 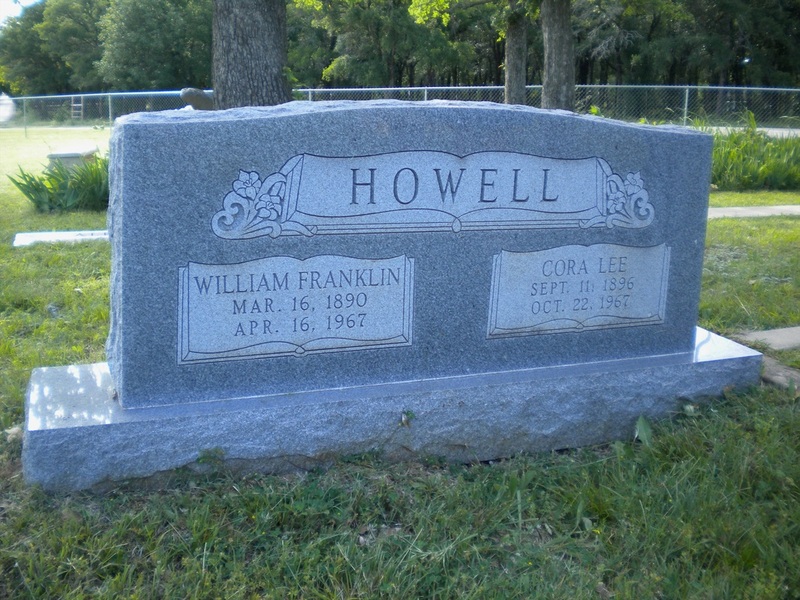 Frank Howell died in April of 1967 after a short illness and his wife, Cora Lee, followed him in death in October 1967. They are buried in the family plot at Clark Cemetery.